Ancestors of mine came from Blythburgh, a little village up the creek from Southwold in Suffolk. In terms of actual ancestors I’m going back to the first half of the nineteenth century, but other relatives hung around for longer and it is one of them I feature today. James Burton, with the unlikely middle name of Skoulding would have been a great great great uncle of mine. It probably goes without saying that I never knew him. Indeed, I don’t even have a photo of him, but I have located his grave in Blythburgh’s church yard – and here it is. 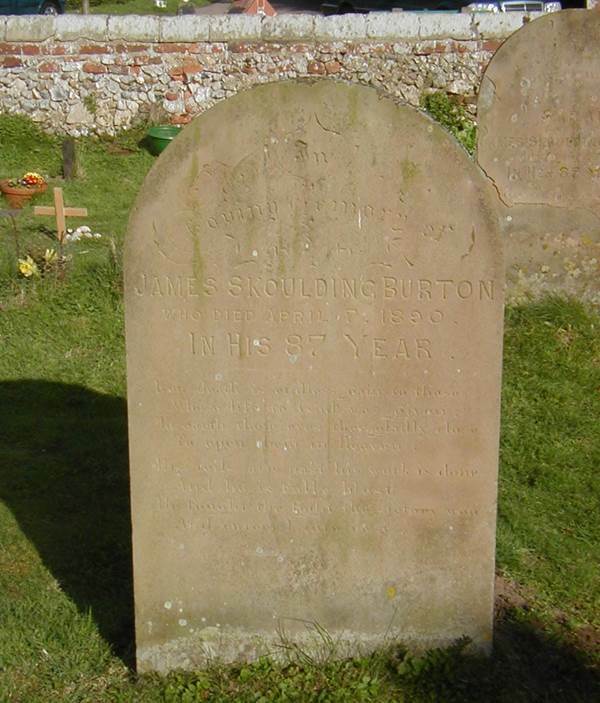 The main inscription reads, simply, ‘In loving memory of James Skoulding Burton who died April 67th 1890 in his 87th year’. The verse underneath is telling readers that James is lucky for he has now gained eternal life. James was born in around 1804 in Blythburgh. He was baptised on 26th February of that year. His middle name came from his grandfather, who was also my five greats grandfather – James Skoulding. James’ elder sister, Sarah, was my 3 greats grandmother. James married Sarah Gray on 9th January 1827. You can see her rather careworn grave behind that of James. The marriage was in the utterly enormous church at Blythburgh. As far as I know, James and Sarah spent their whole life in Blythburgh. The censuses from 1841 to 1881 all tell the same story of James as a shoemaker. The couple had seven children we know of. I have no further details so let’s hope they had a happy life. Do we all like to see a rough sea? I know I do and whenever I see one my mind is transported back to childhood days at Newhaven in Sussex where we’d be thrilled by the sight of the waves smashing over the top of the massive harbour wall. 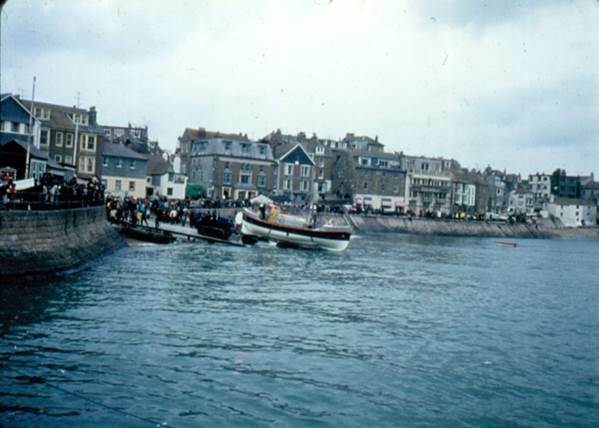 Fifty years on from those happy days I was across the other side of the channel at St Valery en Caux – a small harbour town on the Normandy Coast. Like Skegness, it was bracing or even exhilarating. 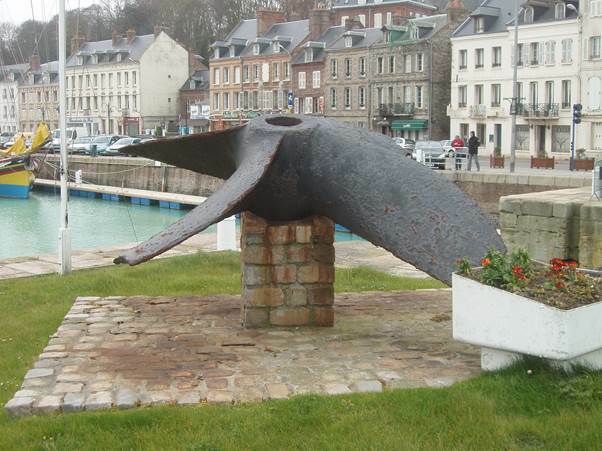 St Valery is just to the west of Dieppe – destination for ferries from Newhaven. It’s an area of France that can remind me of my Sussex childhood. 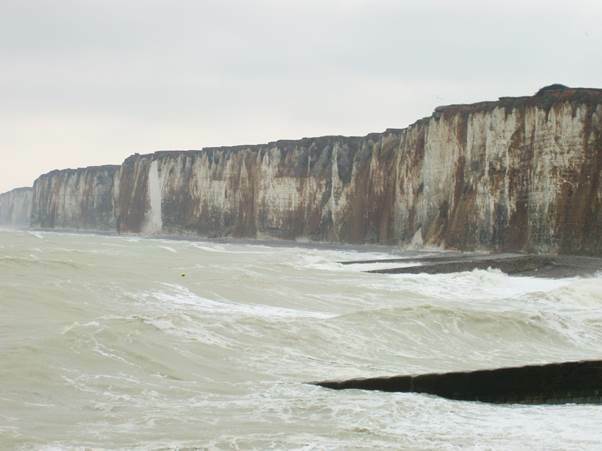 The cliffs at St Valery en Caux are similar chalk cliffs to those at Newhaven. 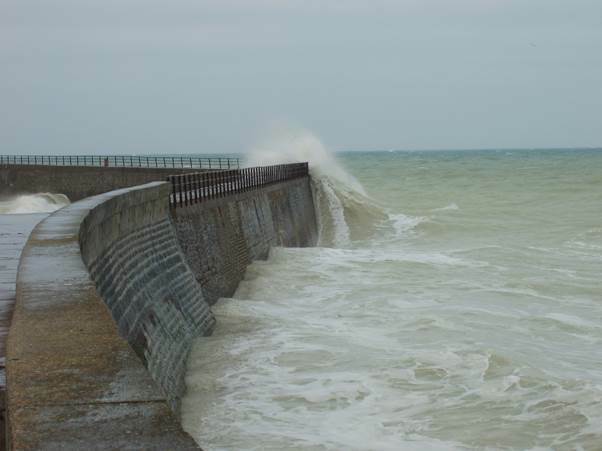 There is a harbour wall – small by comparison with the one at Newhaven, but on a wild day the waves break over it. 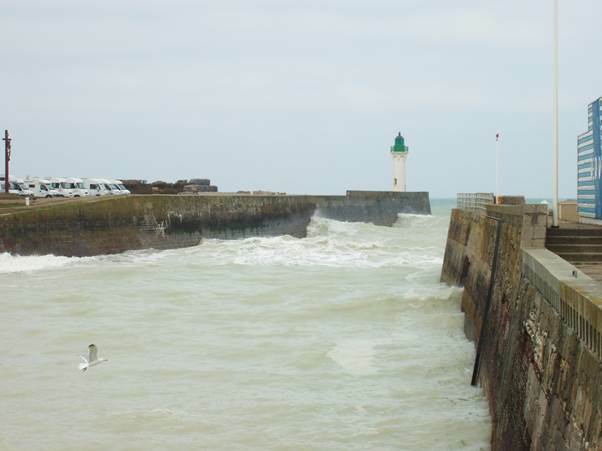 But I don’t recall ever seeing the actual harbour at Newhaven looking this wild. The town, behind the harbour is lovely. 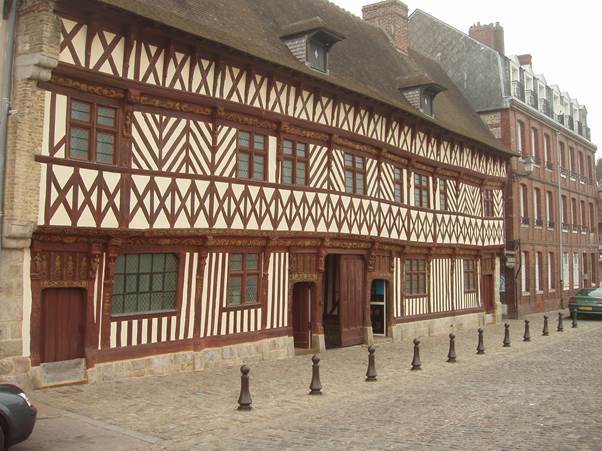 There’s a grand Normandy style house. A safe inner harbour, lined with buildings. Well, I had to include a rather nerdy ship propeller, didn’t I? 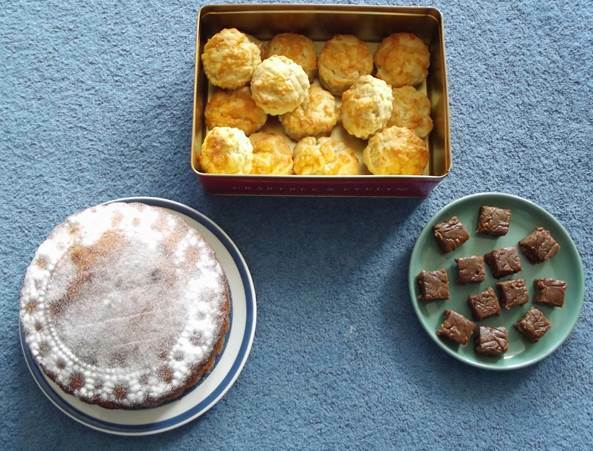 Meet the Relative – Mary Jones. 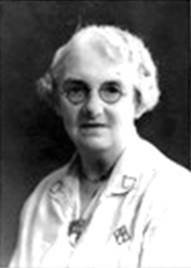 Mary was born on 27th September 1873 at Baguley in Cheshire. Her parents were Robert Jones, a gardener and his wife Ellen (née) Lanceley who were my Great Great Grandparents. Mary, who I never knew, was my Great Great Aunt. At the time of the 1881 census Mary was a scholar, living with parents and siblings at Thorley Road in Timperley – part of the Altrincham district. By 1891, 17 year old Mary was a servant living away from home but still in Timperley. Mary married Edgar Hesp on 1st October 1894 at the church of St Mary, Hulme in Manchester. In 1901 Edgar was a police constable and he and Mary lived in Warrington in Lancashire. They had two sons, Frederick was aged 2 and Harry was just 3 months. The 1911 census is sometimes known as the fertility census for people were asked to say how many children had been born and how many were still alive. Edgar, in filling his form, said 8 born and 6 alive, but in an error, he has written the names of the two deceased children, both of whom were born before Frederick. Three more children were born after the 1911 census. George was born in 1911, Sidney in 1914 and Sybil in 1918. Edgar died in 1947 in Warrington. 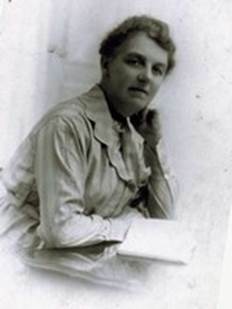 Mary died in 1956 and at that time her address was 11, Manor Dive, Barnton, Northwich, Cheshire. Two little pictures of Mary have come my way. Once again I have a lack of records but these probably came from a descendant of Sidney, born 1914. So there we have a great great aunt I never knew. 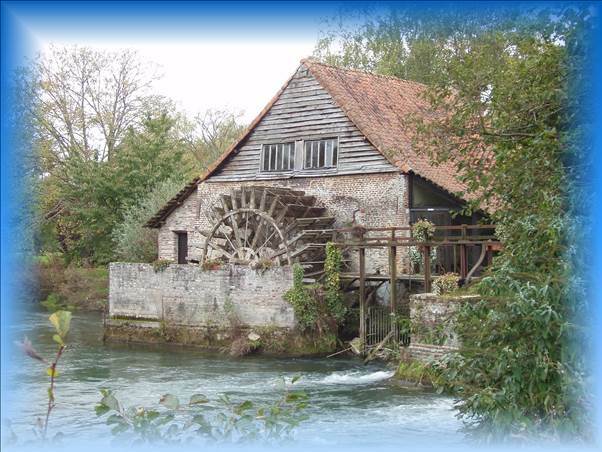 Our meanderings took us to Maintenay which is on the River Authie and here we found a delightful water mill. I liked the photo and for some time had it as the wallpaper on my computer. I faded the edges to blue to provide a better background for the computer shortcuts. The mill is said to be restored and working and so it may be. But we were out of season and there was no sign of life anywhere. It all looked a little ramshackle – and I loved it for that. We don’t pick tourist spots for trips to France. My wife speaks French quite well and I get by. We go to enjoy France, French language and French people. These less favoured (by tourists) spots serve us just as well – particularly when you come across little treasures like this. 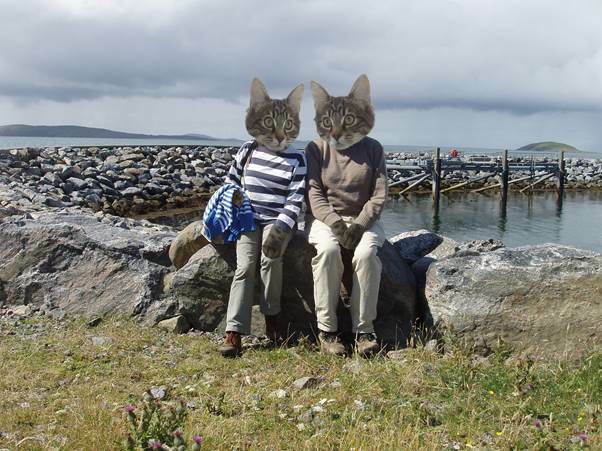 By the way, I don’t often go in for the kind of photo alteration shown here – this one was for a specific purpose. 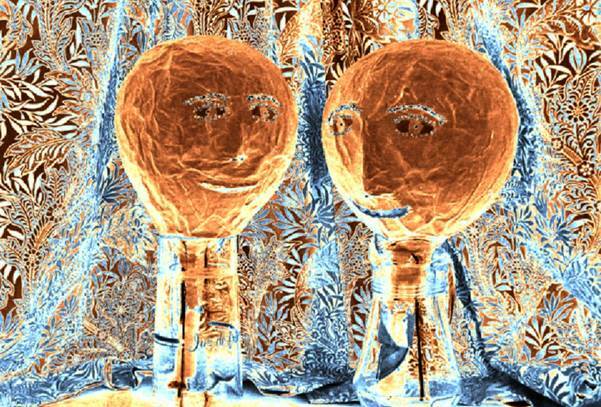 I have been a digital photographer for fifteen years (since 1998) and I guess ultra-manipulation is something many of us pass through. But there is an exception which I’ll make the subject of the next blog. Living in the past – not for me! I must have my Flamborough Head on! It may sometimes seem that I live in the past. I sometimes describe what I thought was a wonderful childhood, full of fun and freedom. But no, I wouldn’t return to those days. Maybe that is because I approach what might get called old age and present day comforts make life so much easier for us adults than was the life of 60 years ago. But mainly, I love the information revolution there has been in that time although that isn’t all to the good. For starters there are far too many people, like me, who have decided they have something to say and so they publish it on the web. Finding real information using search engines gets ever harder because so much banal rubbish is posted amongst the huge amount of good stuff. It must have been frustrating for somebody who wanted to find out about cottages in Great Crosby to arrive at my blog. I have never been to Great Crosby and know almost nothing about the place and have certainly never written about it. But I do have ancestors called Crosby and I have written about them and I’m bound to have used the words ‘great’ and ‘cottages’ somewhere in the blog so my blog gets returned as a site for the search. If only the searcher had put ‘Great Crosby’ in quote marks, he or she would never have found me. I’d have been one down on the stats, but maybe a searcher would have found more useful pages. I suspect they found my one about my great grandparents’ cottage in Ringmer in Sussex. But this is all digression. I set out with the intention of saying something about Flamborough Head in Yorkshire and I came across this slide, taken on the old Canon Demi camera back in 1974. 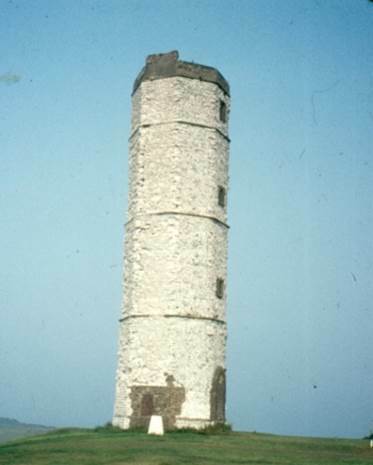 ‘Well what is that rather delightful tower?’ I thought, and of course, using the internet I could identify it as the oldest surviving lighthouse tower in England. It was erected in 1674. Without the internet I’d have been driving to the local town to visit the library to look it up – or more probably, I’d have just shrugged my shoulders and given up. Do you know, I have no memory of seeing this and the photo hasn’t prompted memory at all. 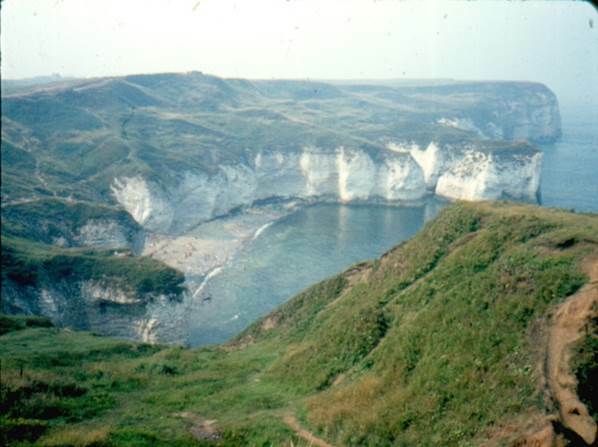 But I remember loving Flamborough head. It’s a chalk headland, where the Yorkshire Wolds reach the sea and I thought it a glorious place. 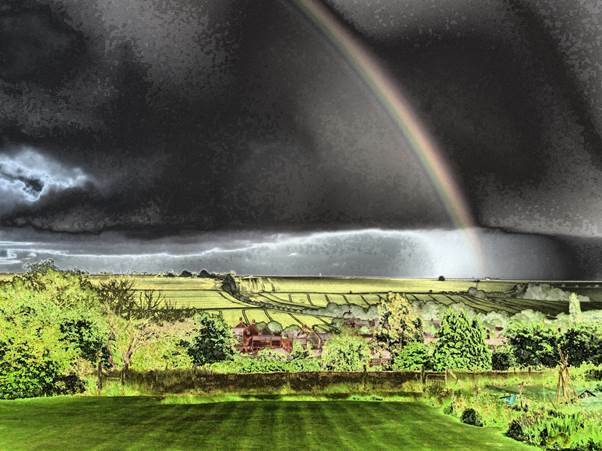 Any time we have been in Yorkshire, I have wanted to go back but we never have. Here’s the scenery that made a big impact on me. Now that’s just magical for me, Maybe next year I’ll get back there. By the way, my wife just walked past this as I was writing and she saw the tower picture. She looked baffled and decided it wasn’t Rattoo Round Tower. She’s right there! Here we have a toy vehicle which dates from my childhood age but wasn’t mine. It originally belonged to my sister in law but seems to have ended up in my house and finds space with my old toy cars. 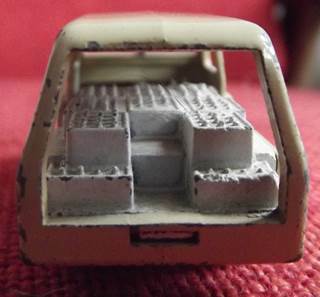 It’s a toy milk float. 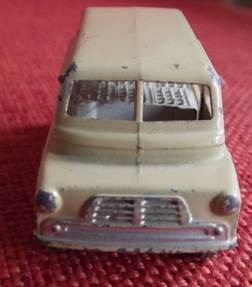 This is based on an early split windscreen Bedford van – I would have called them an iconic vehicle of the era. This toy was made between 1956 and 1960. 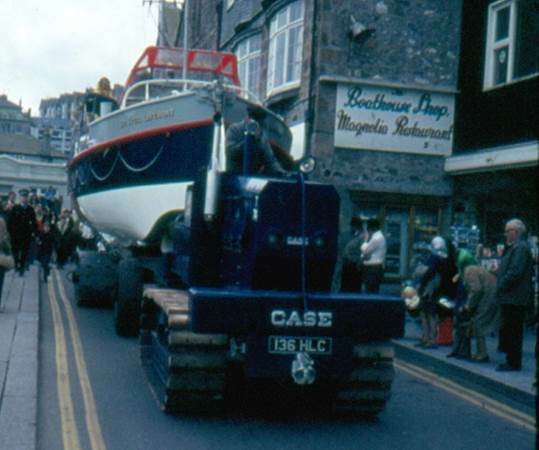 It has that oh so distinctive Bedford front end. The open back is well filled with daily pintas. 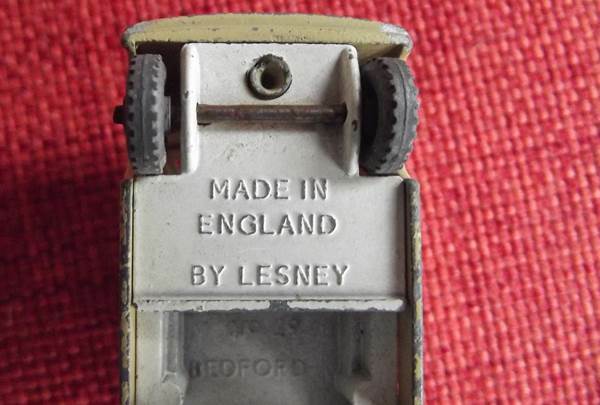 This particular toy is a ‘Matchbox’ toy made by Lesney. Sorry, we don’t have the box. Now apart from the fact that it is rather sweet, why do I particularly like it? 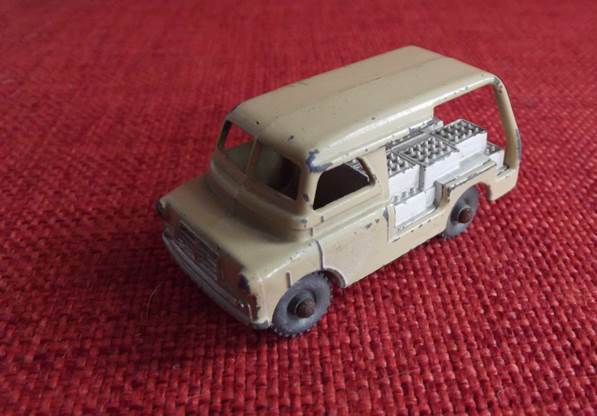 Well, when I reached the ripe old age of 17, the family car was a Bedford Dormobile, based on the same chassis and engine as the Lesney milk float. I learnt to drive in a similar kind of vehicle, albeit without the shake and rattle of milk bottles in the back. What a vehicle! I recall the three speed gearbox, with the lever mounted on the steering column and of course, the sliding doors which could be kept open – ideal, no doubt, for delivery drivers, but potentially lethal, particularly in combination with the total absence of seat belts. So thanks, sister in law. I am delighted to have the little Bedford. Amongst items promised to me by Grandad was his Southern railway pocket watch. The trouble was, he promised these items to cousins as well and one of them ended up with the watch. I think Grandad could see I was gutted when I learned of this and I received other items as kind of compensation. One of them was a leather wallet which, of course, is still in my possession. 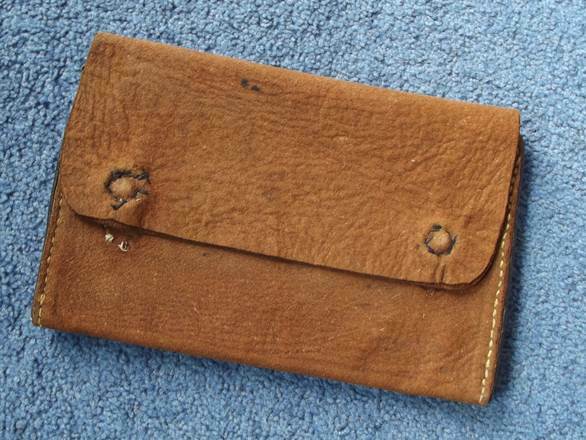 Wallets used to mean something in those long gone days. Getting a wallet was a step on the road to manhood. It was on a par with getting a watch and I daresay great grandfather was proud of his wallet in its elegant brown brushed leather. It was, of course, complete with a full set of compartments for keeping all those essentials for a debonair man about town. You can see in both the photos above that the press studs no longer function, although no doubt if I were armed with a sturdy needle and a sail maker’s palm I could re-attach them properly. 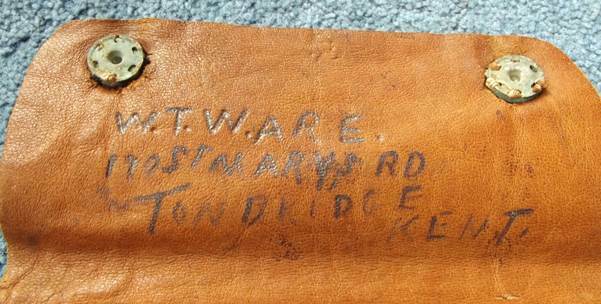 The main reason I am now pleased to have the wallet is because Great Grandad heavily inscribed his name and address in it. It looks as though at first he just had his initials – W. T. W. written firmly in the soft leather. He was William Thomas Ware. The rest of his name and address were added later and less firmly. Great Grandfather was born in 1872 – in Tonbridge. It was his father who was killed in a train crash which I have featured in this blog. (click here). He died when I was about 9 months old so if I ever did meet him I have no memory of it. There’s talk of him being a bit of a lad. He followed his father into railway service. In 1901 he was a railway stoker – a fireman working on the footplate of steam engines but he never progressed to being a driver. There’s a story of over use of alcohol on duty and of his dismissal from the railway service. This is something I haven’t yet managed to verify. In 1911 he was a self-employed firewood manufacturer. Presumably he chopped logs which were sold in the shop his wife ran. His address then was 170 St Mary’s Road in Tonbridge. In 1932 my uncle wrote that his grandad worked for the local water works. The shop was managed by my Grandmother as Grandfather was the engineer for the local water works, this arrangement seemed to work well. I was very happy there despite the strict discipline my Grandfather kept on us. He was a typical Victorian gentleman very fair and I loved him. A story the same uncle told was that he recalled visiting grandfather in hospital and that he was wrapped up in bandages like an Egyptian mummy. Apparently the waterworks pumping engine boiler had exploded. 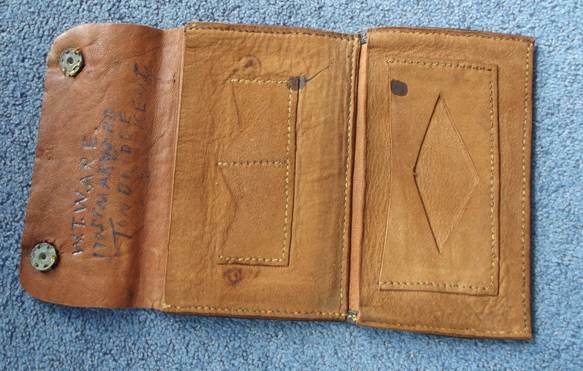 It seems Great Grandfather was an interesting man, so I am pleased to have the wallet.